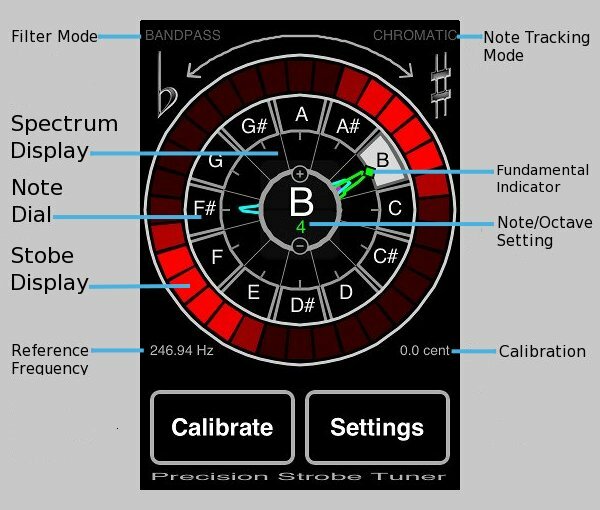 The Precision Strobe Tuner is a General Purpose Musical Instrument Tuning App. The radial Spectrum Display shows the Fundamental of the Input Tone, as well as all the Overtones, radiating like clock hands towards the corresponding Notes along the Note Dial. Apply an Input Tone, and tune to move the Fundamental Indicator Tic Mark, along the inside edge of the Note Dial, towards the center of the desired Note. The outside Strobe Display is used for final tuning. The Strobe Technique has long been the preferred method used by professionals. It is highly sensitive, very accurate, and responds instantly to any change in the Input Pitch.